HomeNo-buy Christmas rule #4: The candles and calendars of advent. The present is not so grim that one can only hope that the days to follow are better than today. A warm home. Food on the table. Clothing. Safety. Education. Blessings touch every day in every corner of the world. But such needs are not yet met for everyone. The world holds men and women who don’t have warmth, food, or clothing. In places both far away and close to home, there are children who don’t understand safety and have never set foot in a classroom. Light a candle for hope, a hope that starts as a whisper and grows to a shout as we stop hoping and start demanding the world in which we want to live. Imagine what an unconditional love for each other would look like, a love that sees the flaws and understands the differences in personality and opinion, but loves anyway. Such a love would bring a smile to your heart and your face. Such a love would bring warmth and purpose to your days. Such a love would intertwine us with our neighbors both across the street and across the globe. Go watch this video. If only we all loved each other like this. Imagine how wonderfully different our world would be. Light a candle for love, a love that you hold in your hand at the start of every day, then offer to everyone you meet. The sunrise. The sound of my children laughing, from the baby right up through to my fifteen-year-old. Dinner at my mother’s surrounded by sisters and nephews and uncles and a goofy grandfather who can still tease despite his eighty-eight years and the oxygen tubes that are now his constant companion. A beer shared with an old friend. A Christmas morning full of shining eyes and wide grins and excitement that cannot be contained. What brings joy to your days? How do you share it with others? Light a candle for joy, a joy that makes you want to sing and dance and that is so contagious that those around you can’t help but to join you. A local radio station plays Christmas music around the clock. A version of “I’ll Be Home for Christmas” is interspersed with the voices of service men and women and their families, mothers, fathers, children, aunts, uncles, nieces, nephews, grandparents, and loved ones who will not be spending the holiday season together because our world is not at peace. Light a candle for peace, a peace in the world that begins with you and spreads to your family, your neighbors, your leaders, and your world. Today marks the first day of the Christian liturgical season known as Advent. In the Christian tradition, Advent serves to count the weeks of anticipation leading to the birth of Jesus. Many Christian denominations mark the season with a wreath that holds four candles. 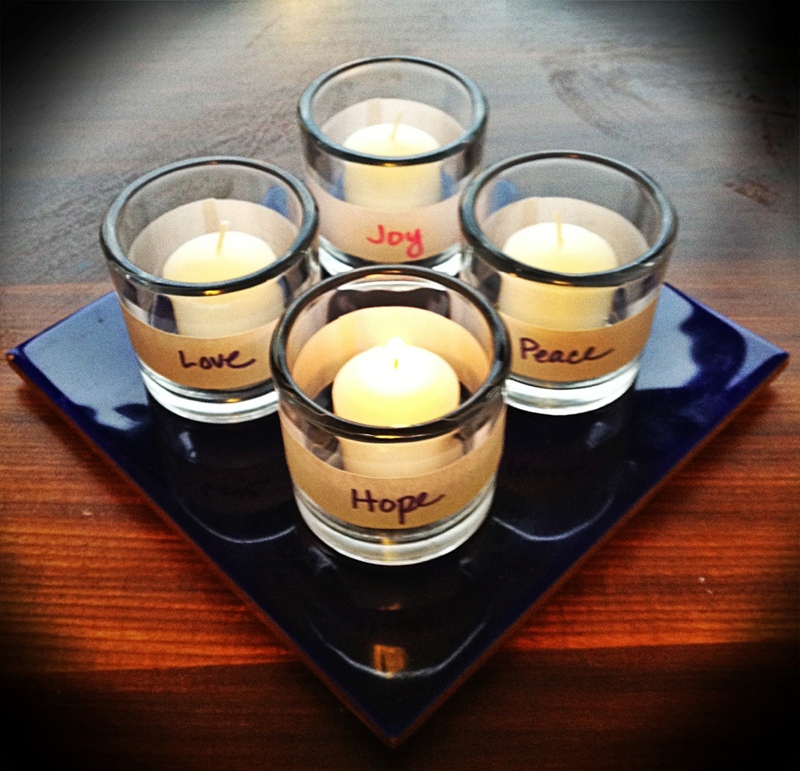 In my own Christian upbringing, those four candles represented hope, love, joy, and peace, each serving as the focus of one of the four Sundays leading up to Christmas day. During the weekly service, a candle is lit, and the readings for the service directly correspond to the theme of the week as it relates to the impending holiday. Like so many Christmas traditions that have migrated from the religious to the secular, advent has become mainstream, marked now by cardboard calendars with shaped chocolates hidden behind little dated doors. Though the liturgical season starts on a Sunday, popular culture has decided that the countdown to Christmas begins on December 1st. In our season of no-buy, I’m stealing all the traditions of advent, though our focus is going to be on each other as members of a global family. 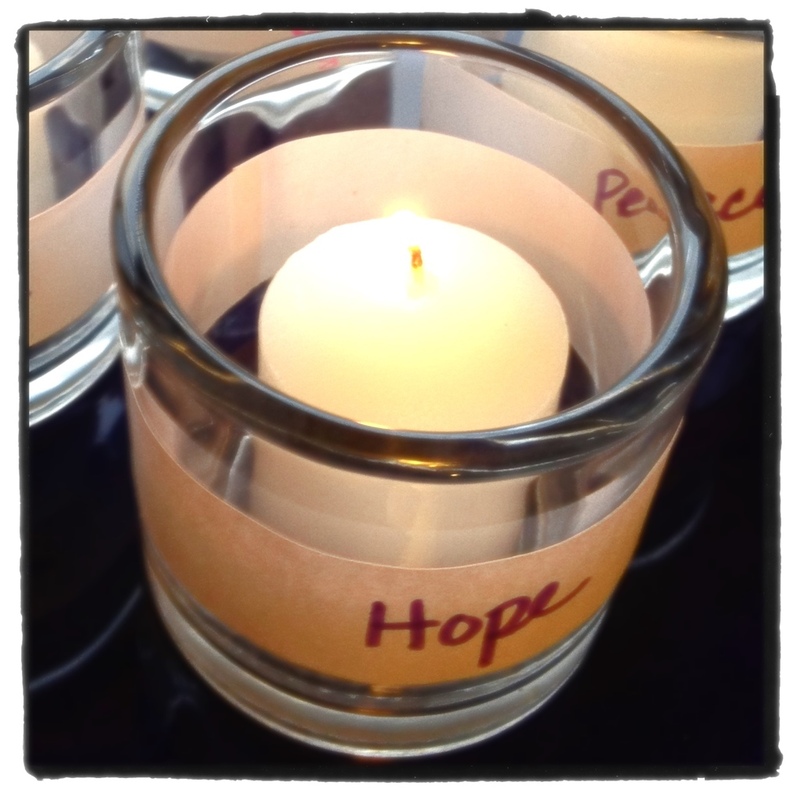 I stole the candles, keeping the notions of hope, love, joy, and peace. Christian or not, all of us can have and share more hope, love, joy, and peace in our everyday. We’ll light the candles each night as we gather around our dinner table and share one thing from our day for which we are thankful. I stole the calendar, and ours started yesterday, on the first. 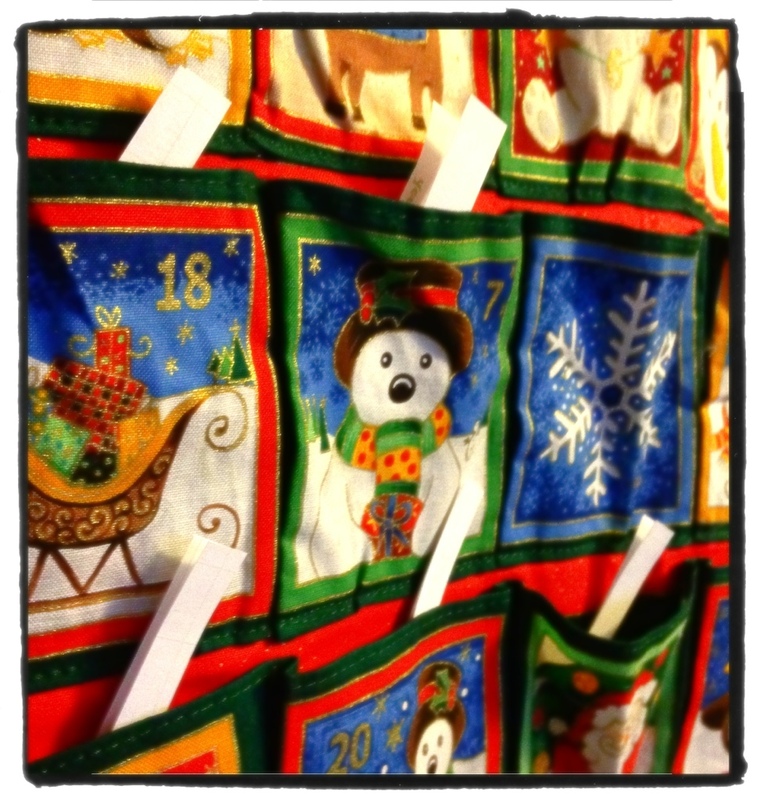 Our advent calendar is a quilted version made by my mother-in-law. In past years, I’ve filled the pockets with sweets, barrettes, little race cars, bubbles, stickers, and countless other treats and trinkets. This year, the little pockets don’t hold goodies; they hold good deeds, ideas and activities to bring hope, love, joy, and peace into our home and our community. Do you have advent traditions that resonate with the spirit of no-buy? Please share! ← No-buy Christmas rule #3: Have super mature, kickass children.